Friend-of-the-blog Nora is doing a little pattern divestiture on eBay — you can check out her listings here. This belief of mine is carried to a ridiculous extreme when I think about estate sales — I mean, c'mon, this is stuff people DIED holding on to! It must be incredibly great! And no matter how many times I go to a sale that consists only of wash-and-wear polyester 1970s housedresses, archival issues of TV Guide ("Who's the Boss?" always seems to feature prominently), and ABSOLUTELY NO FABRIC OR PATTERNS even though "sewing machine" is listed in the ad, I keep believing. But back to this pattern. Boy, I love that yoke! I'd make this in a charcoal gray with red buttons and wear it with a red belt (but not red shoes). So cute! Hey Erin, thanks for the link! I’m really into gray with red lately too. You’re right about how hard it is to get rid of stuff. In fact, as I was describing the patterns I realized all over again why I got them in the first place!But most of them are ones that I just know for one reason or another I’m not going to make up (usually because they don’t honestly suit my body type or my unglamourous lifestyle). So I’d really rather someone else get to sew them, and wear them – that’s what they’re for! (And if they want to share the joy they can post the finished product on the Sew Retro blog. 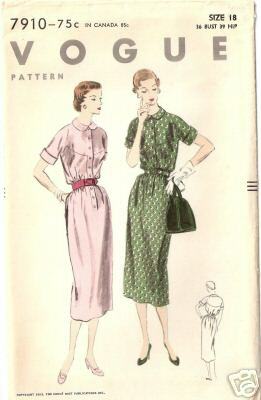 )By the way all, I have a few more to put up, including some (mostly mens’) knitting patterns from the 40s. The pictures are awesome, and goodness knows mens’ fashions don’t change that much. but why would you pass up a perfectly good excuse to wear red shoes!? Am I the only one out there who doesn’t like red shoes? My dad bought me a pair of red patent leather Capezios when I was 2 while my mother was in the hospital having one of my brothers. Mom was expecting him to buy the normal 1960’s toddler saddle shoes, quelle surprise! I love the picture of me in those shoes, but now, just don’t like red period. I do like grey with just a little bit of pink, though. Erin – I don’t know if anyone else has had this experience, but when my mom died and I was put in charge of the “cleaning out”, I got a guy to do the estate sale, not realizing that he had a “specialty”. Since I was doing this all over the phone, I did not realize until I got there and it was all over that all he had sold was furniture and collectibles – all the patterns, fabric, etc. was not seen as important or interesting or worth anything. So, I had to do the whole job all over again in order to try and clean out my parents’ house. So, that is something people might want to remember – sometimes people have specialties or only want to deal with certain types of estate stuff. >>>>and ABSOLUTELY NO FABRIC OR PATTERNS even though “sewing machine” is listed in the ad, I keep believing. ~sigh~That is the story of my life Erin, always the sewing machine and never the patterns. I loved your response to the evil estate sale people who toss patterns! But my roommate CJ & I love the 80s puff-sleeved mostrosities. Especially with big collars, V-waists, and full skirts.